Less than a week after what was seen as an abrupt move by the President to replace the Prime Minister, Namal Rajapaksa, the son of the newly sworn-in Prime Minister, said that his father and the President had been in talks for around “four to five months”. On 26 October, President Maithripala Sirisena fired the elected Prime Minister Ranil Wickremesinghe and replaced him with Mahinda Rajapaksa. On Thursday, Namal Rajapaksa, in an interview with NDTV, said that his father was sworn in on the President’s “invitation and wish” and that the two leaders had been in talks for months. “It was President Sirisena’s invitation and wish. The discussion between the two leaders, as to what they should do next to bring back political, economic and social stability to the country for the next few months, as far as we know, goes back four to five months,” said Namal Rajapaksa, adding that, as old colleagues, they always had a working relationship and had been in touch since the 2015 elections. This runs contrary to Sirisena’s assertion that the surprise move to oust the Prime Minister came after it came to light that a member of Wickremesinghe’s Cabinet had allegedly plotted to kill him. Wickremesinghe had denied the allegations. However, Namal Rajapaksa questioned why he did not say anything about the controversy sooner. “He never mentioned anything like that at that time. He kept quiet till everything escalated. There was a DIG who was involved, who is remanded at the moment, and there are voice recordings that have been given and the voices have been tallied... See, it is a serious allegation and it is a serious investigation, the plot to assassinate a Head of State. But I’m sure what mattered to President Sirisena was not only that, but there are many other reasons,” said Namal Rajapaksa. President Sirisena and the Rajapaksas were on the same side of the political spectrum until they had a falling out. Sirisena joined arms with Prime Minister Wickremesinghe to defeat the Rajapaksas in the 2015 elections. 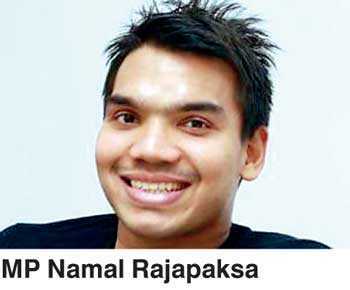 However, Namal Rajapaksa said that this partnership had never really worked. “It never worked. From the first day, of course, we knew, that the alliance was not going to work. There was friction. They both come from two different backgrounds. They have two different political ideologies, two different political parties, and totally extreme economic, social and political policies. So these things will never merge. But, unfortunately, at that time, they saw this as an opportunity to defeat my father. And this entire coalition came together for the 2015 elections. But what I must highlight is they never had a plan to govern the country,” he said. The recent shifts in the political tides in the country has raised concerns in India as well. While Wickremesinghe is perceived to be more India-friendly, Mahinda Rajapaksa is seen to have pro-China leanings. However, Namal Rajapaksa reassures that India need not worry. “There is no Chinese or any sort of foreign influence on any decision taken by my father or his Government. We do know that in the past there was a misperception or misunderstanding between India and Sri Lanka. India shouldn’t be worried at all. India will be a developing partner for us. India had been working very closely with my father during the war. India helped us defeat terrorism. And we fought India’s war. Prabhakaran assassinated Rajiv Gandhi. We all know that. So, we fought not only our war, but we brought peace to the region. My father brought peace to the region,” he said.